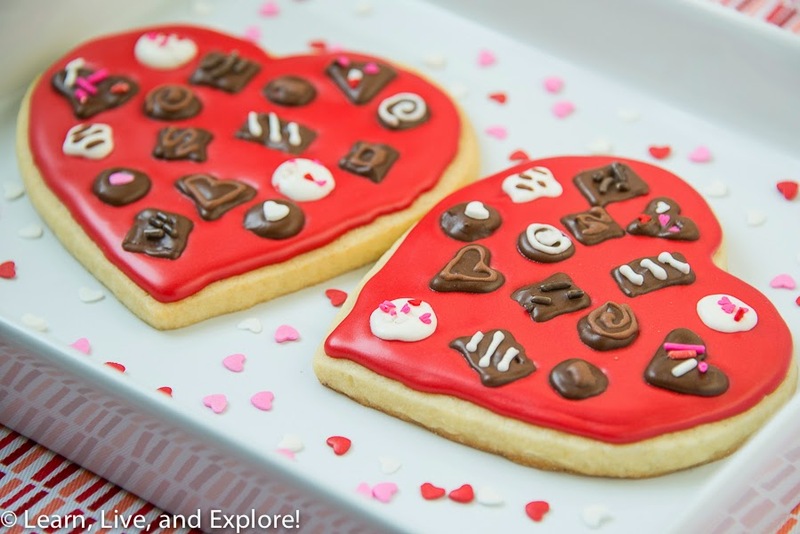 Heart Shaped Chocolate Box Cookies ~ Learn, Live, and Explore! The first step, before making the cookies, is making the candies. This is the fun part because you get to design them however you want. Just imagine that first moment when you open up a box of chocolates, that moment of excitement when you're faced with so many yummy things from which to choose. 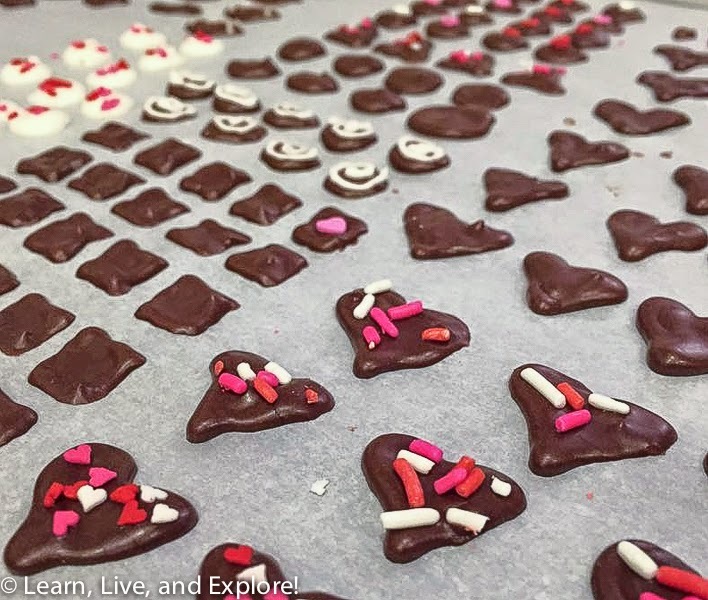 The "chocolates" are simply royal icing, piped on a large sheet of parchment paper, and left to dry overnight. Go wild with shapes and sizes. 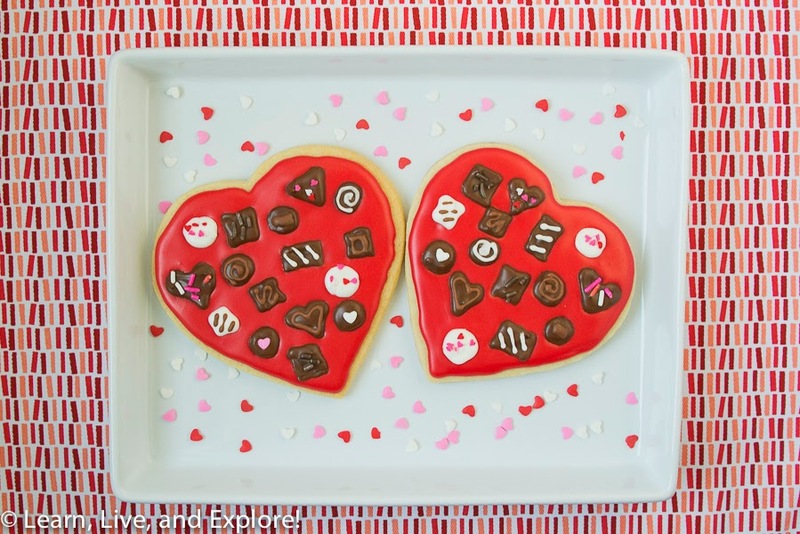 Make some plain ones, make some with a piped design on top, and make some with decorations like heart sprinkles and chocolate jimmies. You can make these ahead of time and store them in an air tight container for a few days. Day of the cookie making, take some more royal icing, colored in your preferred hue, and flood the cookie. 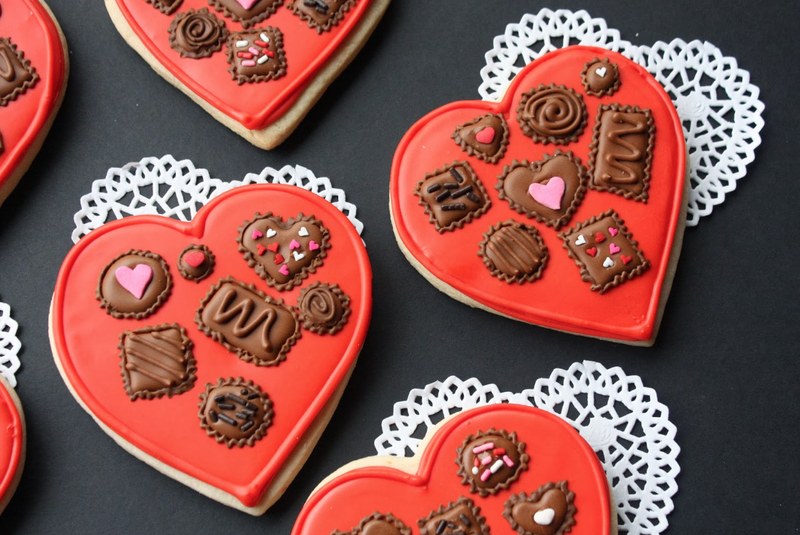 Drop the "chocolates" on carefully while the cookie is still wet, within 30 seconds. I would suggest that you lay out your chocolate pattern before to save time. If you wait too long, you run the risk that the smooth flooded icing top cracks when you're setting your chocolates. The inspiration photo shows some brown squiggle piping around the chocolates to suggest a paper holder. I tried that on some cookies, but since I had more chocolates in my "box" it got a little messy. I'm still happy with how they turned out. In fact, I LOVE them. Happy Valentine's Day!